When it comes to analyzing the feasibility of a project SWOT is up there with the best of them. Its powerful enough to diagnose a business and simple enough to be used by an individual. However if not done properly it can give you misleading results and cost you time and money. Listed below are some common SWOT analysis mistakes and what you can do to avoid them. Listing down too many things is probably the most common SWOT analysis mistake. This usually happens when there is no clear goal or if the scope is not well defined. In an organization, many people are involved in creating the SWOT analysis and long lists make it harder to figure out what’s critical and what’s not critical. How to Fix: Clearly explain why you’re doing the SWOT analysis and what you’re trying to achieve by doing it. Stick to 3-5 important points for each section. Going nowhere with your SWOT diagram? Let’s face it, most of us are guilty of doing this. Every software company thinks they have the best developers and every hotel thing they have the best chefs. But it usually isn’t the case. Strengths are usually the first to be added to the SWOT when everyone is fresh and eager to contribute. So it’s very easy to go overboard with strengths. Point 1 helps a bit here. Because you’re forced to limit it to 3-5 points you think a bit more about what to include. Still its easy to overestimate your strengths and that can be very damaging when you actually implement your project. How to Fix: Properly analyze your strengths. Get unbiased opinions from outsiders if necessary. If its a product or a service put yourself in a customers shoes. Will they actually consider it a strength compared to your competitors? A less obvious but a very dangerous SWOT analysis mistake. For example, if you’re running a software company a weakness could be “long release cycle”. It’s obviously a weakness but its hard to create an actionable strategy by looking at that factor. It could be delayed for a number of reasons. But if you added that factor as “insufficient QA resources” then anyone looking at the diagram can instantly identify the problem and take action to rectify the problem. How to Fix: Don’t generalize factors and try to add cause/reason as a factor. Also whenever possible make sure to add quantitative values. Almost everyone is reluctant to admit weaknesses. It is even harder during a SWOT analysis because you’re on a high now after identifying your most important strengths. It is even harder in a business environment because nobody wants to show a weakness in front of their superiors. However, underestimating your weaknesses can be more dangerous than overestimating strengths. How to Fix: Be critical of your weaknesses. Encourage people to come up with weaknesses and assure them that it won’t be held against them. If many are participating you can ask each person to list down weaknesses separately and then pick the most important ones from them. Opportunities and threats present a different challenge. Strengths and weaknesses are internal factors so it is somewhat easy to figure and list them out. Not so easy with opportunities and threats because they are external factors. PESTLE analysis provides businesses with a standard and structured way to assess those external factors. 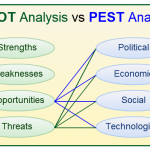 Unfortunately, people often confuse SWOT analysis and PEST analysis. And businesses that ignore it might miss out on great opportunities or might start to see opportunities when they don’t exist. How to Fix: Do a proper PESTLE analysis and pick your opportunities and threats from that analysis. 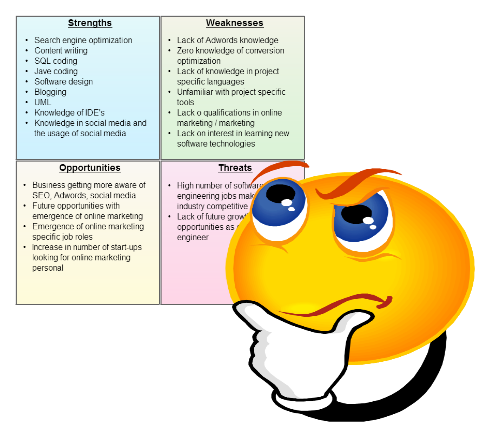 Know More SWOT Analysis Mistakes? I think I’ve covered most of the common SWOT analysis mistakes. SWOT analysis is a very effective way to analyze your business, but if you make the above mistakes you’ll end up with a faulty SWOT diagram that can actually harm your business. Know any more common mistakes? We love to hear from you, so feel free to share them in the comments section. Confident enough to create your first diagram? Get started with our SWOT analysis templates. When writing personal SWOT Analysis, the lack of balance between hard (too many) and soft skills (too few if any) is a common mistake among techies. Another blind spot is the confusion between Strengths and Opportunities. I see it is true when you say people forget about PEST analysis. It can be confused when we think that we can one of them. The fact is, we should do the PEST to understand the Opportunities and Threatens. SWOT analysis is a comparison. If you’re a coffee shop then you’re comparing yourself with other coffee shops in the area. Compare your strong points with your competitors and add them to the strengths sections. Similarly fill the rest.